Divine Intervention – Scaffolding & Access of Biblical Proportions! Pulling back the curtain for opening night. Restoring the Forrest Theater. Superior Scaffold installed a 580 foot long work deck or platform on both sides of the barrel shaped Reading Terminal Market (RTM) to give crews access to replace the roof. The platform is 6 feet wide by 8 feet high by 580 feet long and allows crews to roll their equipment and material from the mast climber at one end to their location anywhere along building. 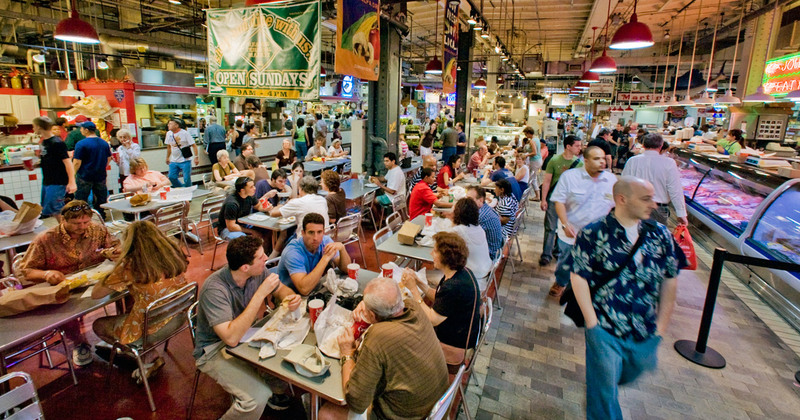 Reading Terminal Market is a sprawling, somewhat chaotic, indoor farmer’s market and food haven where over 100 merchants offer culinary treats, fresh produce and unique merchandise. It occupies an old train shed that was built in 1893 and is located at 12th and Arch Streets in downtown, Philadelphia. On the outset this might seem like a simple procedure but getting crews and equipment on top of a curved building took some ingenuity. Leave it to our resident swing king, Bob Sarkisian, to come up with a unique design. The biggest challenges were tying into the wood truss that ran all the way down the inside of the barrel (needed to support and stabilize) and then setting the supporting scaffold. This shows how we tied into that truss and then weatherproofed the connection with a sealed rubber boot. This also gives you a good idea of the grade of the roof. The work platform was decked with steel plank and plywood the entire length of the building and enabled crews to use their rolling equipment carts to easily move material to their location. It has toe board and guard rails down the entire length. There is system scaffold, trusses and compression tie-ins underneath. It’s really quite the design. Here you can see the permanent metal ladder built into the dome which allowed the crew to take their gear and material up to the top of the roof. Let’s switch gears and talk about what we did at the ground level. This is the other part of this massive job – a giant overhead protection system. You’ll notice that this overhead protection system is constructed of bridge columns instead of our normal system scaffold or frames. We painted the debris panels green to blend in better and added debris netting for protection. It spans over Filbert St. We had to have 2 giant 50 foot steel beams specially manufactured to span that gap. You can clearly see them in this shot. Cranes were brought in to set them into place. Alternate Design Solutions engineered the steel beams for us. The canopy on the Arch St. side (and the crosswalk from the new convention center to the old one) is 120’ long by 8’ high by 8’ wide on each side. There is also a stair tower and mast climber on each side of the RTM to provide crews with access and the material they need up on the roof. If you haven’t been to the RTM, you should make it a destination – it’s really something to see and the food is awesome. This has been a great project to work on and we are thankful to GC – EDA for letting us be a part of it. If you need access solutions to any project call Bob at Superior Scaffold today at (215) 743-2200 or visit www.superiorscaffold.com for more information. I think the following photo gives you the best perspective on just how steep the roof is and what a marvel the platform turned out to be. I couldn’t decide on today’s musical number, they both seemed to hit the mark, so I put them both up… enjoy. This entry was posted on Friday, February 24th, 2017 at 9:02 am	and is filed under Canopy, Mast Climber, Rentals, System, Work Platform. You can follow any responses to this entry through the RSS 2.0 feed. Both comments and pings are currently closed. © 2007-2019 Superior Scaffold Services. All rights reserved.